Tetrao is a genus of birds in the grouse subfamily. 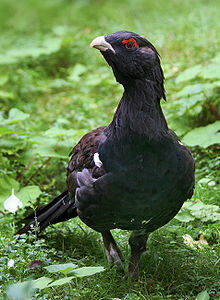 The genus name is derived from the Latin name of a gamebird, probably the black grouse. ^ Jobling, James A (2010). The Helm Dictionary of Scientific Bird Names. London: Christopher Helm. p. 383. ISBN 978-1-4081-2501-4. This Galliformes article is a stub. You can help Wikipedia by expanding it. This page was last edited on 20 March 2019, at 11:26 (UTC).